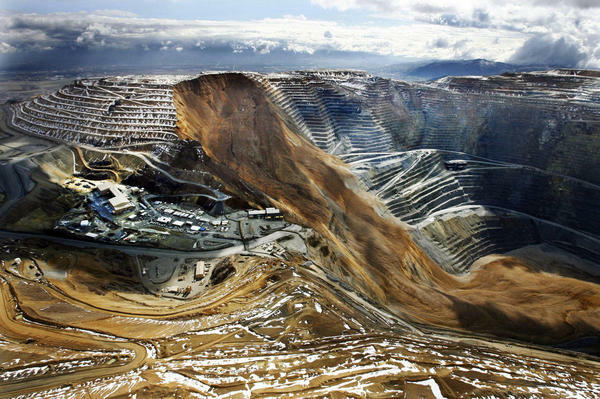 If you haven’t seen photos of the massive landslide that struck Utah’s Bingham Canyon copper-gold mine on April 10, check out the story and accompanying photo gallery at the Deseret News, and these spectacular photos at the Kennecott Utah Copper page on Facebook. 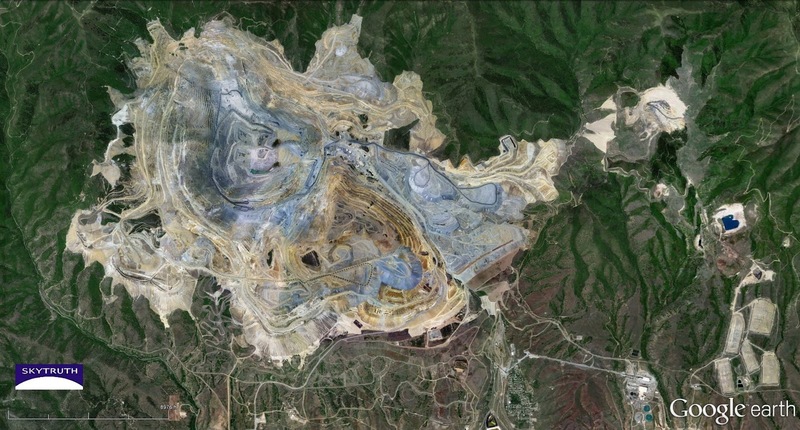 Aerial shot of landslide in Bingham Canyon copper-gold mine near Salt Lake City, Utah. 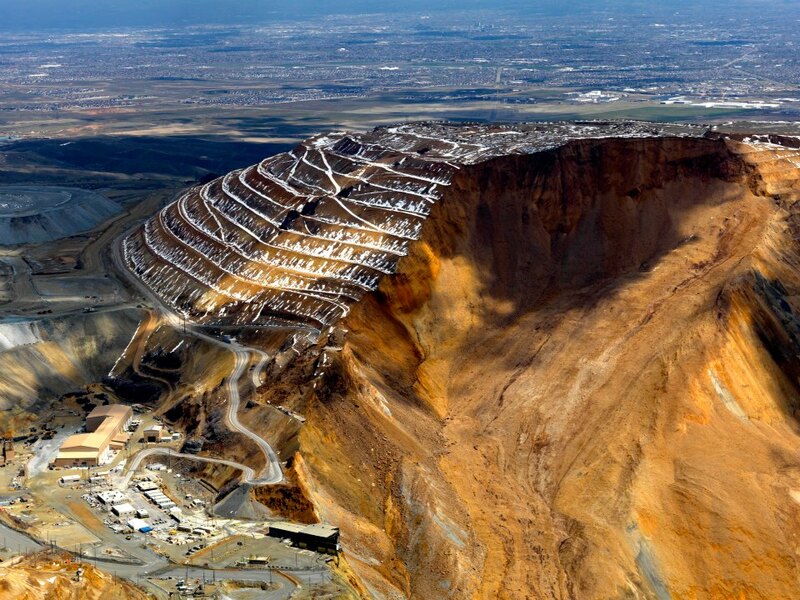 Photo courtesy Kennecott Utah Copper via Facebook. 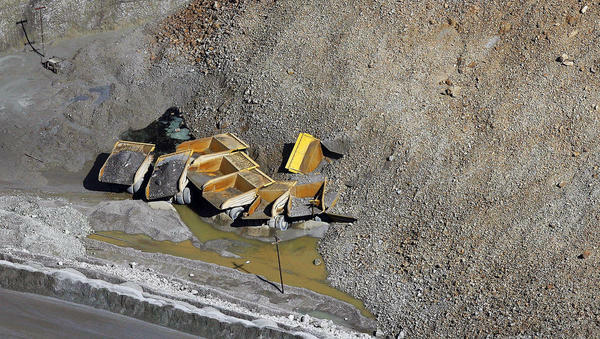 Mining trucks partly buried by landslide. Photo courtesy Deseret News. Aerial view of landslide. Photo courtesy Deseret News. Pre-landslide view from Google Earth. 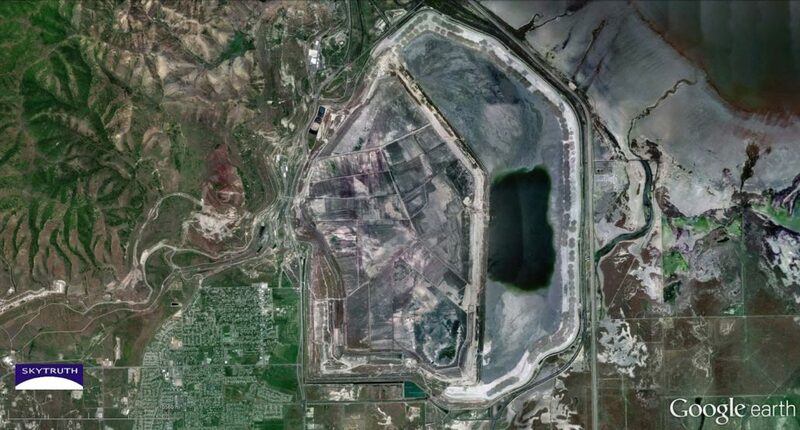 Stepping back a bit, it’s interesting to see how close this mining operation is to residential neighborhoods on the western outskirts of Salt Lake City; especially the 9,000 acre (14 square mile) tailings impoundment located on the banks of Great Salt Lake about 15 miles north of the mining pit. Earthworks details some of the environmental problems and public health risks in this brief report [PDF]. 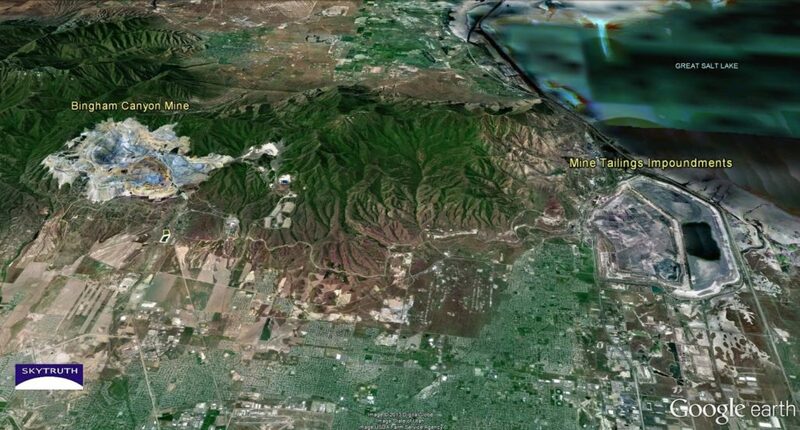 You can explore this area with high-resolution imagery from 2010 in Google Earth and Google Maps. And here is a super-detailed view of the area that failed from Bing Maps — maybe you mining engineers out there can identify the fault or other structural weakness that lead to the failure. Let us know if you see anything interesting! 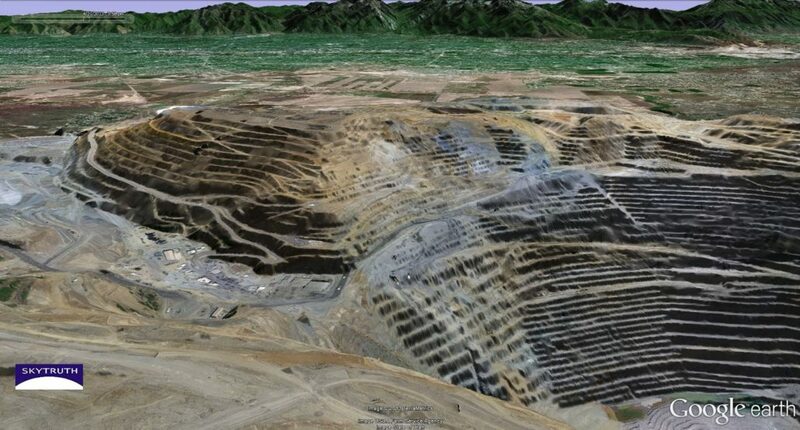 Panoramic overview of the Bingham Canyon mining operation, looking west. Salt Lake City suburbs fill the lower third of the view. Great Salt Lake at upper right. Vertical view from 2010 imagery showing the active mining pit. Vertical view from 2010 imagery showing the 9,000-acre tailings impoundment. Note residential area at lower left, between SkyTruth logo and the impoundment. In the first photograph some of the rocks on the steepest portion are blurred, as if still in motion. In the pre-failure photograph the zone which eventually failed completely is similarly blurred, as if there were no sharp shadows, as if corners were already crumbling and sloughing. I suppose snow melting on the benches lubricated the system and triggered the massive slide. Miners and engineers would be aware of these things. But for the guy sitting on the toilet in that overhanging building …. That's a great observation CJ – the post-slide photo may look blurry because the material is very fluid in overall appearance compared to the surrounding hardrock benches of the mine pit. But the blurriness in the area that failed, in the pre-slide Google imagery, could be due to lighting and illumination effects, or a slight mismatch between the topographic data and the imagery in Google. It might also indicate that this part of the pit wall was unstable and shifting, causing the topo-image mismatch. Or it could look blurry because there is more loose debris accumulated on the benches in this section compared with the part sof the pit that didn't slide, suggesting overall instability in the bedrock that failed. The sharper Bing imagery (http://binged.it/ZAe6p3) does seem to show more loose rock debris accumulation on the benches in the area that failed. I think that overhanging building may have actually been the mine's visitor center. What a view! Overhanging building was the truck shop, hence the high bays. Blurred photo is due to wind whipping fresh dust from the newly-exposed area (notice the clouds and weather in the background). Blurring in Bing detail is because mining was occurring on the eastern benches at the time of the google photo (see grids of blast holes and trucks loading in the area). Blasting often loosens rock on other benches in the area, causing a flowing appearance. This is normal. Utemike – thanks for that explanation! Makes good sense. Dominique – that is very cool – thanks for sharing the link.